"Prime Minister of Ireland" redirects here. For other uses, see Prime Minister of Ireland (disambiguation). The Taoiseach (/ˈtiːʃəx/ ( listen)) is the prime minister and head of government of Ireland. [note 2] The Taoiseach is appointed by the President upon the nomination of Dáil Éireann, the lower house of the Oireachtas (parliament), and must, in order to remain in office, retain the support of a majority in the Dáil. While commanding the confidence of the majority of Dáil Éireann. No term limits are imposed on the office. The word taoiseach means "chief" or "leader" in Irish and was adopted in the 1937 Constitution of Ireland as the title of the "head of the Government, or Prime Minister". [note 2] Taoiseach is the official title of the head of government in both English and Irish, and is not used for other countries' prime ministers (who are referred to in Irish as Príomh Aire). The Irish form, An Taoiseach, is sometimes used in English instead of "the Taoiseach". Outside of Ireland, the Taoiseach is sometimes referred to as the Prime Minister of Ireland. Leo Varadkar TD is the current Taoiseach; he took office on 14 June 2017, following his election as leader of Fine Gael on 2 June 2017. Varadkar is the youngest Taoiseach in the history of the Irish state, having taken office at the age of 38; he is also the first openly LGBT person, and the first person of Indian descent, to lead the Irish government. Under the Constitution of Ireland, the Taoiseach is nominated by a simple majority of Dáil Éireann from among its members. He/she is then formally appointed to office by the President, who is required to appoint whomever the Dáil designates, without the option of declining to make the appointment. For this reason, it is often said that the Taoiseach is "elected" by Dáil Éireann. If the Taoiseach loses the support of a majority in Dáil Éireann, he/she is not automatically removed from office but, rather, is compelled either to resign or to persuade the President to dissolve the Dáil. The President may refuse to grant a dissolution and, in effect, force the Taoiseach to resign; to date, no president has exercised this prerogative, though the option arose in 1944 and 1994, and twice in 1982. The Taoiseach may lose the support of Dáil Éireann by the passage of a vote of no confidence, or implicitly through the failure of a vote of confidence; or alternatively, the Dáil may refuse supply. [note 3] In the event of the Taoiseach's resignation, he/she continues to exercise the duties and functions of his/her office until the appointment of a successor. The Taoiseach nominates the remaining members of the Government, who are then, with the consent of the Dáil, appointed by the President. The Taoiseach also has authority to advise the President to dismiss cabinet ministers from office, advice the President is required to follow by convention. The Taoiseach is further responsible for appointing eleven members of the Seanad. The Department of the Taoiseach is the government department which supports and advises the Taoiseach in carrying out his/her various duties. Since 2013, the Taoiseach's annual salary is €185,350. It was cut from €214,187 to €200,000 when Enda Kenny took office, before being cut further to €185,350 under the Haddington Road Agreement in 2013. A proposed increase of €38,000 in 2007 was deferred when Brian Cowen became Taoiseach and in October 2008, the government announced a 10% salary cut for all ministers, including the Taoiseach. However this was a voluntary cut and the salaries remained nominally the same with both ministers and Taoiseach essentially refusing 10% of their salary. This courted controversy in December 2009 when a salary cut of 20% was based on the higher figure before the refused amount was deducted. The Taoiseach is also allowed an additional €118,981 in annual expenses. There is no official residence of the Taoiseach. In 2008 it was reported speculatively that the former Steward's Lodge at Farmleigh adjoining the Phoenix Park would become the official residence of the Taoiseach; however no official statements were made nor any action taken. The house, which forms part of the Farmleigh estate acquired by the State in 1999 for €29.2m, was renovated at a cost of nearly €600,000 in 2005 by the Office of Public Works. 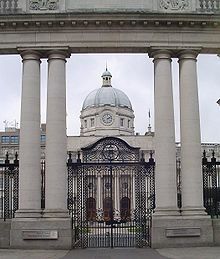 Former Taoiseach Bertie Ahern did not use it as a residence, but his successor Brian Cowen used it "from time to time". The words Taoiseach (Irish: [ˈt̪ˠiːʃəx]) and Tánaiste (the title of the deputy prime minister) are both from the Irish language and of ancient origin. Though the Taoiseach is described in the Constitution of Ireland as "the head of the Government or Prime Minister",[note 2] its literal translation is chieftain or leader. Although Éamon de Valera, who introduced the title in 1937, was neither a Fascist nor a dictator, it has sometimes been remarked that the meaning leader in 1937 made the title similar to the titles of Fascist dictators of the time, such as Führer (Hitler), Duce (Mussolini) and Caudillo (Franco). Tánaiste, in turn, refers to the system of tanistry, the Gaelic system of succession whereby a leader would appoint an heir apparent while still living. In Scottish Gaelic, tòiseach translates as clan chief and both words originally had similar meanings in the Gaelic languages of Scotland and Ireland. [note 4][note 5] The related Welsh language word tywysog (current meaning: prince) has a similar origin and meaning. [note 6] It is hypothesized that both derive ultimately from the proto-Celtic *towissākos "chieftain, leader". The plural of taoiseach is taoisigh (Irish: [t̪ˠiːʃiː]). It seems to me to be mere make-believe to try to incorporate a word like "Taoiseach" in the English language. It would be pronounced wrongly by 99 percent of the people. I have already ascertained it is a very difficult word to pronounce correctly. That being so, even for the sake of the dignity of the Irish language, it would be more sensible that when speaking English we should be allowed to refer to the gentleman in question as the Prime Minister... It is just one more example of the sort of things that are being done here as if for the purpose of putting off the people in the North. No useful purpose of any kind can be served by compelling us, when speaking English, to refer to An Taoiseach rather than to the Prime Minister. The President of the Executive Council, Éamon de Valera, gave the term's meaning as "chieftain" or "Captain". He said he was "not disposed" to support the proposed amendment and felt the word "Taoiseach" did not need to be changed. The proposed amendment was defeated on a vote and "Taoiseach" was included as the title ultimately adopted by plebiscite of the people. The modern position of Taoiseach was established by the 1937 Constitution of Ireland and is the most powerful role in Irish politics. The office replaced the position of President of the Executive Council of the 1922–1937 Irish Free State. The positions of Taoiseach and President of the Executive Council differed in certain fundamental respects. Under the Constitution of the Irish Free State, the latter was vested with considerably less power and was largely just the chairman of the cabinet, the Executive Council. For example, the President of the Executive Council could not dismiss a fellow minister on his own authority. Instead, the Executive Council had to be disbanded and reformed entirely in order to remove a member. The President of the Executive Council also did not have the right to advise the Governor-General to dissolve Dáil Éireann on his own authority, that power belonging collectively to the Executive Council. In contrast, the Taoiseach created in 1937 possesses a much more powerful role. He can both advise the President to dismiss ministers and dissolve Parliament on his own authority—advice that the President is almost always required to follow by convention. [note 7] His role is greatly enhanced because under the Constitution, he is both de jure and de facto chief executive. In most other parliamentary democracies, the head of state is at least the nominal chief executive, while being bound by convention to act on the advice of the cabinet. In Ireland, however, executive power is explicitly vested in the Government, of which the Taoiseach is the leader. Since the Taoiseach is the head of government, and may remove ministers at will, many of the powers specified, in law or the constitution, to be exercised by the government as a collective body, are in reality at the will of the Taoiseach. The Government almost always backs the Taoiseach in major decisions, and in many cases often merely formalizes that decision at a subsequent meeting after it has already been announced. Nevertheless the need for collective decision making on paper acts as a safeguard against an unwise decision made by the Taoiseach. Historically, where there have been multi-party or coalition governments, the Taoiseach has been the leader of the largest party in the coalition. One exception to this was John A. Costello, who was not leader of his party, but an agreed choice to head the government, because the other parties refused to accept then Fine Gael leader Richard Mulcahy as Taoiseach. In 2010 Taoiseach Brian Cowen, in the midst of highly unpopular spending cuts after the global financial crash, maintained his position as Taoiseach until new elections, but stood down as leader of Fianna Fáil and allowed Micheál Martin (who had resigned in protest at the way Cowen responded to the crises) to succeed him. Before the enactment of the 1937 Constitution, the head of government was referred to as the President of the Executive Council. This office was first held by W. T. Cosgrave of Cumann na nGaedheal from 1922–32, and then by Éamon de Valera of Fianna Fáil from 1932–37. By convention, Taoisigh are numbered to include Cosgrave; for example, Leo Varadkar is considered the 14th Taoiseach, not the 13th. The most recent Taoiseach to die was Liam Cosgrave (served 1973–1977) on 4 October 2017, aged 97. ^ a b Before the enactment of the 1937 Constitution of Ireland, the head of government was referred to as the President of the Executive Council. This office was first held by W. T. Cosgrave from 1922–32, and then by Éamon de Valera from 1932–37. ^ John Frederick Vaughan Campbell Cawdor (1742). Innes Cosmo (ed.). The book of the thanes of Cawdor: a series of papers selected from the charter room at Cawdor. 1236–1742, Volume 1236, Issue 1742. Spalding Club. p. xiii. Retrieved 23 June 2013. As we cannot name the first Celtic chieftain who consented to change his style of Toshach and his patriarchal sway for the title and stability of King's Thane of Cawdor, so it is impossible to fix the precise time when their ancient property and offices were acquired. ^ "Tartan Details - Toshach". Scottish Register of Tartans. Archived from the original on 2 December 2013. Retrieved 27 June 2013. Toshach is an early Celtic title given to minor territorial chiefs in Scotland (note Eire Prime Minister's official title is this). ^ John Thomas Koch (2006), Celtic Culture: a Historical Encyclopedia, ABC-CLIO, p. 1062, ISBN 1851094407, An early word meaning 'leader' appears on a 5th- or 6th-century inscribed stone as both ogam Irish and British genitive TOVISACI: tywysog now means 'prince' in Welsh, the regular descriptive title used for Prince Charles, for example; while in Ireland, the corresponding Taoiseach is now the correct title, in both Irish and English, for the Prime Minister of the Irish Republic (Éire). ^ Among the most famous ministerial dismissals have been those of Charles Haughey and Neil Blaney during the Arms Crisis in 1970, Brian Lenihan in 1990 and Albert Reynolds, Pádraig Flynn and Máire Geoghegan-Quinn in 1991. ^ Cosgrave also headed the Irish Government from August 22, 1922, during the transitional period before the state became officially independent on December 6, 1922 (See Irish heads of government since 1919). ^ De Valera also headed the pre-independence revolutionary Irish Government from 1 April 1919	to 9 January 1922 (See Irish heads of government since 1919). ^ Oireachtas, Houses of the. "Salaries, Houses of the Oireachtas". www.oireachtas.ie. Retrieved 14 June 2017. ^ "Taoiseach: definition of Taoiseach in Oxford dictionary (British & World English). Meaning, pronunciation and origin of the word". Oxford Language Dictionaries. Oxford University Press. 2013. Retrieved 30 November 2013. ^ McDonald, Henry (2 June 2017). "Leo Varadkar, gay son of Indian immigrant, to be next Irish PM". The Guardian. Retrieved 16 July 2018. ^ "Finance and Expenditure combined as Cabinet is named". RTÉ News. 14 June 2017. Retrieved 14 June 2017. ^ "Leo Varadkar voted leader of Fine Gael". Irish Times. Retrieved 14 June 2017. ^ "The Taoiseach, Ministers and every TD are having their pay cut today". TheJournal.ie. 4 July 2013. Retrieved 18 December 2013. ^ "Taoiseach to receive €38k pay rise". RTÉ News. 25 October 2007. ^ "Sharp exchanges in Dáil over Budget". RTÉ News. 15 October 2008. Retrieved 29 January 2009. ^ "Opposition says Lenihan's salary cuts do not add up". Irish Independent. 10 December 2009. Retrieved 29 December 2009. ^ "Opulent Phoenix Park lodge is set to become 'Fortress Cowen'". Irish Independent. 18 May 2008. Retrieved 18 May 2008. ^ "Cowen questioned on use of Farmleigh". The Irish Times. 29 January 2009. Retrieved 29 January 2009. ^ a b "Youth Zone School Pack" (PDF). Department of the Taoiseach. Retrieved 23 June 2010. ^ John-Paul McCarthy (10 January 2010). "WT became the most ruthless of them all". Irish Independent. Retrieved 22 November 2016. While Taoiseach itself carried with it some initially unpleasant assonances with Caudillo, Fuhrer and Duce, all but one of the 12 men who wielded the prime ministerial sceptre have managed to keep their megalomaniacal tendencies in check. ^ E. William Robertson (2004). Scotland Under Her Early Kings: A History of the Kingdom to the Close of the Thirteenth Century Part One. Kessinger Publishing. p. 32. ISBN 9781417946075. Retrieved 28 June 2013. ^ "DSL - SND1 TOISEACH". Archived from the original on 2 December 2013. Retrieved 27 June 2013. ^ Frank Mr. MacDermot of the Centre Party (Ireland) - Bunreacht na hÉireann (Dréacht)—Coiste (Ath-thógaint) - Wednesday, 26 May 1937; Dáil Éireann Debate Vol. 67 No. 9. ^ - Bunreacht na hÉireann (Dréacht)—Coiste (Ath-thógaint) - Wednesday, 26 May 1937; Dáil Éireann Debate Vol. 67 No. 9. ^ "Coughlan new Tánaiste in Cowen Cabinet". The Irish Times. 17 May 2008. Retrieved 17 May 2008. ^ "Taoiseach reveals new front bench". RTÉ News. 7 May 2008. Retrieved 17 May 2008. ^ "Cowen confirmed as Taoiseach". BreakingNews.ie. 7 May 2008. Retrieved 17 May 2008. ^ "Former Taoisigh". Department of the Taoiseach. Archived from the original on 17 July 2011. Retrieved 23 June 2010. ^ "Kenny's farewell: 'This has never been about me'". RTÉ News. 13 June 2017. Retrieved 14 June 2017. ^ Lord, Miriam (8 June 2017). "Taoiseach-in-waiting meets man waiting to be taoiseach". The Irish Times. Retrieved 10 June 2017. The book Chairman or Chief: The Role of the Taoiseach in Irish Government (1971) by Brian Farrell provides a good overview of the conflicting roles for the Taoiseach. Though long out of print, it may still be available in libraries or from AbeBooks. Biographies are also available of de Valera, Lemass, Lynch, Cosgrave, FitzGerald, Haughey, Reynolds and Ahern. FitzGerald wrote an autobiography, while an authorised biography was produced of de Valera. There is a chapter by Garret FitzGerald on the role of the Taoiseach in a festschrift to Brian Farrell. There is a chapter by Eoin O'Malley on the Taoiseach and cabinet in 'Governing Ireland: From cabinet government to delegated governance'(Eoin O'Malley and Muiris MacCarthaigh eds.) Dublin: IPA 2012. Garret FitzGerald, "Just Garret: Tales from the Political Frontline"
Wikimedia Commons has media related to Taoisigh.